2011 marks the 20th anniversary of Mazda's extraordinary victory in the world's most demanding endurance race, the 24-Hours of Le Mans. In 1991, Mazda became the first and only Japanese car manufacturer to win the race - completing 362 laps at an average speed of 127.62mph. In celebration of this anniversary, and at the invitation of the event organisers, the Automobile Club de L'Ouest (ACO), Mazda will demonstrate the winning Mazda 787B on the Circuit de la Sarthe in Le Mans, France on Saturday, June 11, before the 2011 race begins. The 79th 24-Hours of Le Mans is scheduled to start at 15.00 hrs (local time). Mazda plans to hold the demonstration of the 787B racecar at 12.30 hrs. In addition, the 787B will also take part in the Driver's Parade through the Le Mans city centre on Friday June 10. The Mazda 787B became the first and only Japanese car, and rotary-engine car to win the 24-Hours of Le Mans. Jointly developed by Mazda and Mazdaspeed, the organisation that managed Mazda's racing programme, the 787B featured a chassis designed to meet Group C technical regulations and was powered by a four-rotor rotary engine that produced 700ps. Due to a change in the race regulations, 1991 was to be the last year that a rotary-engine car could participate at Le Mans. So, exploiting this last opportunity, after 17 years of effort, Mazda finally realised its long-held dream to take the overall victory at Le Mans. This victory was not Mazda's alone, it was the result of many years of hard work by Mazdaspeed, the drivers (England's Johnny Herbert, Belgian Bertrand Gachot and German Volker Weidler), suppliers and the many others involved. Takashi Yamanouchi, Mazda's representative director, chairman of the board, president and CEO, said, "Mazda is founded on a desire to ‘never stop challenging.' This spirit brings Mazda Group employees together across the globe, and it inspires us to achieve the demanding goals we set ourselves. "Exactly 50 years ago, in 1961, Mazda commenced development of the rotary engine. The road from this beginning until our 1991 victory at Le Mans, and on to our current SKYACTIV technology development programme, is built upon our spirit of challenge. 2011 is set to be another landmark year for the entire Mazda Group, as we enter our SKYACTIV era with the global introduction of our next-generation vehicles." 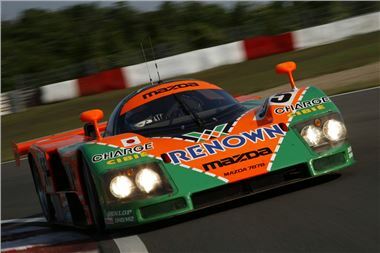 Since 1991, the Le Mans winning Mazda 787B has been on display at the Mazda Museum in Hiroshima, Japan. In preparation for the demonstration at Le Mans this year, Mazda has carefully restored the 787B racecar back to driving condition for the first time since its post-race overhaul in 1991. The work was carried out by current Mazda employees who participated in the company's original Le Mans Challenge Project, along with engineers from Mazda's subsidiary engineering company Mazda E&T. The restored 787B has been tested by Mazda's in-house development drivers, and its performance has been confirmed by former Mazda factory drivers Yoshimi Katayama, Takashi Yorino and Yojiro Terada at Mazda's Mine Proving Ground in western Japan. As part of the 20th anniversary celebrations, various members of the 1991 Mazda team will also return to Le Mans. One of the three winning drivers, Johnny Herbert (England), will be joined by 1991 Mazda drivers David Kennedy (Ireland), Pierre Dieudonné (Belgium) and other team members. The year after, in 1992, the stunning, 'Fast & Furious' starring Mazda RX-7 twin-turbo was launched with the advertising line by Eddie Greenwood: "Le Mans 1991. Le Mazda 1992."